The earliest history is shrouded in legend , the first settlement was probably in the 9th Century BC by Merchants from Achaean Greeks who used the area as trade foothold. By the 7th Century BC Greek colonists from Rhodes established a permanent city named Parthenope after one of the legendary Sirens who had tempted Odysseus. In the 6th Century BC Parthenope was a busy trade and military port , in competition with Cumae , settled by Greek from Chalcis. Incursions of Etruscans from Northern Italy left Parthenope weakened and in 550 BC the city was taken by the neighboring Cumaeans. Around 474 BC , Greeks from Syracuse founded next to the site of Parthenope a new city "Neapolis", in 450 BC Neapolis attracted new Greeks from Chalcis , Pithecusa and Athens. Neapolis remained a true Greek City , part of Magna Graecia. The Samnites ,Italic Tribe from the Apennines took both Campania and the City in 400 BC. In 326 BC , Neapolis fell to the Latins Romans who incorporated the territory into its confederation. Naples and its environs remained a center of Greek Civilisation and for Rome eager for the Culture of the East , a magnet for artists and patrons of the Arts. Romans patricians such as Lucullus and Emperors Augustus and Tiberius spent much of their time in the area. The Social wars , in which Naples sided Sulla in 82 BC against Mario , brought the sacking of the city, and it started its shift from a life based on Trade to a leisure Capital of the Roman Aristocracy of the late Republic and Empire. In the 4th Century AD , the city role declined as Constantine moved the imperial Court to Constantinople , Naples fell into a slow economic slump and is literally the scene of the decline of tha Roman Empire. Romulus Augustulus , last Western Roman Emperor , died (476 AD )as prisoner of Odoacer Chief of the Herulians Barbarians. Naples was one of the earliest parts of Europe to feel the Christianity , St Paul arrived in Pozzuoli on his way to Rome , many catacombs testify that was an important center of Christian Culture and Art. In 401 Alaric from the royal House of Balthas chief of the Visigoths (Germanic Tribes West of the Black Sea) ivaded Italy , ravaged Venetia. In 410 after the Sack of Rome passed through Naples bringing destruction. In 455 Gaiseric Chief of the Vandals took over again Rome and Naples. By 490 the most of Italy fell under the Rule of Theodoric Chief of the Ostrogoths ( Germanic Tribes east of the Black Sea). The Emperor Justinian (Constantinople Roman Emperor) as part of his grandiose reconstitution of the Roman Empire , dispatched a brilliant General : Belisarius and later Narses capable and cruel; they launched the reconquest (535-554) of southern and central Italy and drove the Germanic invaders over the Alps. In 554 Justinian's Pragmatic Sanction restored the Italian lands taken by the Ostrogoths and made a restoration of Government , but agricultural lands were depopoulated and grown into wilderness , towns declined. "Duces" were appointed , probably over each "Civitas" , as part of the Imperial Administration , a fusion of the ducal title and landowonership favoured a new class of hereditary military proprietors. Totila the new Gothic King (541-552) recaptured Rome and Naples despite Belisarius and Narses return. 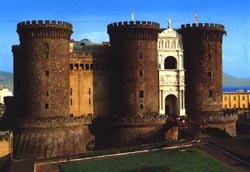 The city of Naples remained under Gothic control. Rome was now a small provincial town , despite Constantinople had taken Southern Italy , the way was open to the Lombards , a tribe from eastern Germany , under King Alboin, who invaded the South in 568. The Lombards decided to divide the new Kingdom in Italy in 36 "Lombard Dukes". The peninsula was a mosaic of Byzantine , papal and Lombard jurisdictions: Pavia the Lombard Capital after 573 , Rome the Papal Capital and Ravenna the Byzantine Exarchate. Saracens were Rulers of Sicily ; Apulia and Calabria under the feeble rule of Constantinople; Gaeta , Naples were Independent Byzantine Dukedoms . Amalfi was a city Republic and Benevento , Capua and Salerno were Lombard principalities. The Normans invasion gained a foothold in Aversa (near Naples) with Tancred of Hauteville.(c.1029). The Emperor Conrad II the Salian in 1037 restored order in the south and with his Constitutio de feudis made Italian fiefs hereditary. The rivalry and the weakness of the local Rulers ,facilitate the conquest of the Realm by the Normans , taking over Sicily in 1060-1090. Roger of Hauteville became King of Sicily. For the seven sons of Tancred of Hauteville, a minor Norman nobleman, war was the family business. About 1030 Tancred's two oldest sons, William and Drago, joined other Normans as mercenaries in southern Italy. There they served the Pope and his Lombard allies in attempting to expel the Eastern Roman (Byzantine) Empire--based in Constantinople--from its remaining outposts in Apulia. William d'Hauteville, for reasons perhaps suggested by his nickname "Iron Arm," emerged as leader of the Norman mercenaries. He assumed the title Count and, through the next decade, brought most of Apulia under control of his Norman forces. In later years the d'Hautevilles' personal control over the new principality was strengthened as William and Drago were joined by their brothers, especially the two youngest, Robert "Guiscard" (meaning, "the Resourceful"), who arrived in 1046, and Roger, who joined his older siblings about 1057. By 1053 Pope Leo IX realized that by encouraging the Normans to oust the Byzantines the Papacy had exchanged a weak and harmless enemy for a powerful and menacing friend. The magnitude of the new problem was exposed in 1053. The Pope determined to nip the nascent power of the Normans in the bud, but the army he sent to achieve that purpose was decisively defeated in a battle at Civitate. Thereafter the Normans, led by the two youngest d'Hautevilles, Robert and Roger, rapidly expanded their power throughout Apulia and added Calabria as well. Finally, in 1059 Pope Nicholas II made the best of a bad situation by creating an alliance of sorts with the d'Hautevilles. In exchange for a nominal commitment of allegiance from the d'Hautevilles, the Pope formally confirmed Robert's claim not only to Apulia and Calabria, but to Sicily as well. Sicily, of course, was actually under Saracen rule; the Pope had in effect granted the Normans a license to conquer the island. The ambition of the Normans under leadership of the d'Hauteville brothers was fuelled, not sated, by their success in establishing a principality in southern Italy in the mid-1000s. As a result, they were eager, with modest encouragement from the Papacy, to extend their empire to Saracen-ruled Sicily under the banner of Christendom. In 1060 the Norman leader Robert Guiscard with his brother Roger d'Hauteville opened their invasion of Sicily. The Normans first stormed and captured Messina, that traditional stepping stone from the Italian mainland into Sicily. In subsequent years, aided by dissension among the Saracens and supported by elements of the indigenous Greek population, the Norman invaders fought their way across northern Sicily. They captured the Saracen capital of Palermo ten years later, in 1071. The tide of war in eastern Sicily seesawed back and forth, with major cities taken and then retaken by the contending forces. Finally, in 1090 the last Saracen stronghold fell, and the Normans were left in complete control of the entire island. The two powerful d'Hauteville brothers demonstrated a skill in governance that was equal to their skill in warfare. Robert and Roger established an amicable arrangement between themselves for allocating captured spoils and dividing power. That agreement left Robert as ruler of southern Italy and Roger as ruler of Sicily. Relations in the next generation were less peaceable. Roger's son, another Roger (who was crowned king of Sicily as Roger I), weathered an extended period of hostility with various changing alliances among his mainland cousins, the Papacy and other Italian princes. Finally he succeeded in uniting Sicily and the d'Hauteville territory on the mainland into a single powerful kingdom--the Kingdom of Two Sicilies (Citra Farum and Ultra Farum ). The Kingdom was called of Sicily and covered Sicily, Calabria, Apulia, Lucania and Campania, the capital was Palermo. On the island of Sicily the d'Hautevilles introduced a period of remarkable tolerance, with even-handed treatment of the Greek and Saracen populations, who were joined by an increasing migration of new settlers from the Italian mainland. The Norman dynasty, however, was to be only a brief interlude before Sicily became a chip in the high-stakes game of European politics. The crown of King Roger I (1062 - 1101 ), the first crowned king of Sicily, passed peaceably to his son William I and grandson William II. The Norman Count Roger II of Sicily(1103-1154) succeeded the norman William Duke of Apulia (1111-1127) and assumed (1130) the Title of King of Sicily,Apulia and Capua with the approval of anti-Pope Anacletus II, excommunicated by Pope Innocent II (1139), he defeated Innocent and took him prisoner and forced the recognition of the Title. William I (1154-1166), continuing Roger's policy defeated (1156) the Byzantine allies of Pope Adrian IV and compelled Adrian to recognize his Title in Sicily, Apulia, Naples, Amalfi and Salerno. William II (1166-1189) planned a Mediterranean empire and wished a free hand, he welcomed the marriage (1186) of Constance , Roger II' s daughter, his heiress, to the future Emperor Henry VI. Tancred of Lecce (1190-1194), son of Roger duke of Apulia and brother of Constance led a vigorous native resistance to the emperor Henry VI (King of Sicily 1194-1197) with the support of Papacy and Richard I of England but Henry reduced Sicily and Southern Italy with the aid of Genoa and Pisa .The Norman Rule ended with Tancred. The Norman Kinship in Southern Italy and Sicily was Theocratic along the lines of the Byzantine Heritage; the administration was efficient , prosperity and balanced taxation made the Sicilian Monarchs perhaps the richest in Europe. Dealing with a cosmopolitan Kingdom containing Italian, Greek and Saracen elements , the Norman Rulers practiced a tolerant eclecticism which provided for a wide racial divergences in law , religion and culture. Henry VI plans to unite the German and the Sicilian Crowns , and to crown Frederick without election, were blocked by powerful German and Papal opposition. Frederick was elected King of the Romans (1196). Plans for the foundations of a Mediterranean Empire( traditional with the Norman Kings of Sicily) on the ruins of the Byzantine Empire as the basis for an universal dominion. Sicilian outbreak against the German administration was brutally crushed and a bitter anti-imperial reaction in Italy and a long civil war in Germany followed Henry's sudden death. The Civil war in Germany (1197-1212) generated chaos in the Empire , two rival Kings : Philip of Swabia (Henry's brother ) and the Welf Otto of Brunswick challenged the imperial succession. Philip (1208), imperial coronation of Otto (1209 ), Papal break ( Innocent III ) with Otto and support of Frederick , second election of Frederick to the Empire ( 1211 ) and dash to Germany. Frederick II ( 1212 -1250 ) " Stupor Mundi" , charming , pitiless and arrogant , one of the Most of brilliant ruler and learned men of his days, a great legislator , diplomat , skeptic and a leading scientific investigator of his times , Sicilian by taste and culture , half Norman by blood was crowned King of Sicily in 1198 , King of the Romans in 1212 , King of the Germans at Aachen in 1215 , Emperor at Rome in 1220 . 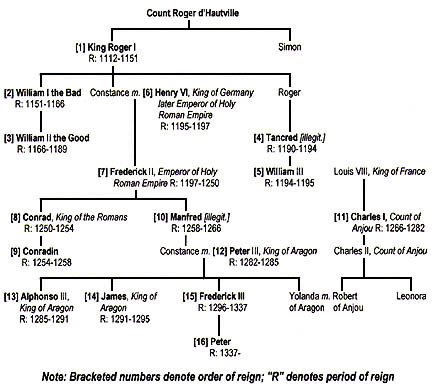 The main guide-lines of the reorganization of the Kingdom were : clean sweep of private Titles and Royal privileges in the Norman manner ; resumption of Royal Domain ; destruction of private garrison and feudal Castles ; ban on private war ,criminal jurisdiction transferred from Feudal to Royal Courts ; clergy taxed and excluded from civil office. Local rising and unrest in Southern Italy ( 1228- 1230 ). The most constructive "Legislation" in the Middle Ages (partially a continuation of Roger II and influenced by Roman Law) : ( Centralized and efficient bureaucrazy ; clerical jurisdiction limited to ecclesiastical matters ; simony in civil office a criminal offense and careful financial organisation ). He founded the University of Naples ( first in Europe on Royal Charter ) 1224 and the school of medicine in Salerno . The advance economic policy based on Arab practice , abolition of internal tools, mercantilistic regulation , replacement of Feudal dues by fixed payments and efficient custom collection made his ruling one of the most prosperous in the Middle Ages. In 1250 Frederick II died after a lingering illness.His enemies regrouped to seek revenge. In 1251 Naples rose , formed a free commune ; Conrad IV son of Frederick , was absent fighting his war in Germany , his illegitimate son Manfred became Balio , or Regent , for the Regno and the Hohestaufens holdings in the North . Pope Innocent IV (S.Fieschi) (1243-1254) , hoped to crush the Hohenstaufens in both Germany and Italy and raised candidates among European Royal Families to replace them . Conrad IV reached immediately Naples to consolidate his power . The Emperor Frederick II is a very convenient example of the sort of doubter and rebel the thirteenth century could produce. It may be interesting to tell a little of this intelligent and cynical man. 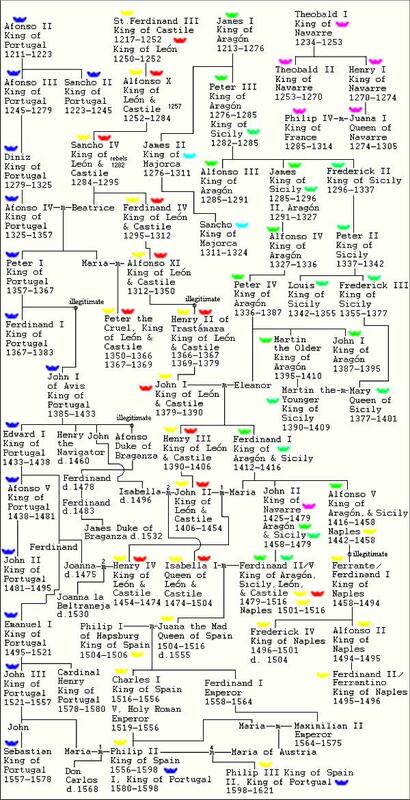 He was the son of the German Emperor, Henry VI, and grandson of Frederick Barbarossa, and his mother was the daughter of Roger I, the Norman King of Sicily. He inherited this kingdom in 1198, when he was four years old; his mother was his guardian for six months, and when she died, Pope Innocent III (1198 to 1216) became regent and guardian. He seems to have had an exceptionally good and remarkably mixed education, and his accomplishments earned him the flattering title of "Stupor Mundi", the amazement of the world. The result of getting an Arabic -view of Christianity, and a Christian view of Islam, was to make him believe that all religions were impostures, a view held perhaps by many a stifled observer in the Age of Faith. But he talked about his views; his blasphemies and heresies are on record. Growing up under the arrogant rule of Innocent III, who never seems to have realized that his ward had come of age, he developed a slightly humorous evasiveness. It was the papal policy to prevent any fresh coalescence of the power of Germany and Italy, and it was equally Frederick's determination to get whatever he could. When presently opportunity offered him the imperial crown of Germany, he secured the Pope's support by agreeing, if he were elected, to relinquish his possessions in Sicily and South Italy, and to put down heresy in Germany. For Innocent III was one of the great persecuting Popes, an able, grasping, and aggressive man. (For a Pope, he was exceptionally young. He became Pope at thirty-seven.) It was Innocent who had preached a cruel crusade against the heretics in the south of France, a crusade that presently became a looting expedition beyond his control. So soon as Frederick was elected emperor (1211), Innocent pressed for the, performance of the vows and promises he had wrung from his dutiful ward. The clergy were to be free from lay jurisdiction and from taxation, and exemplary cruelties were to be practised upon the heretics. None of which things Frederick did. He liked Sicily as a place of residence better than be liked Germany. Innocent III died baffled in 1216, and his successor, Honorius III, effected nothing. Honorius was succeeded by Gregory IX (1227), who evidently came to the papal throne with a nervous resolution to master this perplexing young man. He excommunicated him at once for failing to start upon his crusade, which was now twelve years overdue; and he denounced his vices, heresies, and general offences in a public letter (1227). To this Frederick replied in a far abler document addressed to all the princes of Europe, a document of extreme importance in history, because it is the first clear statement of the issue between the pretensions of the Pope to be absolute ruler of all Christendom, and the claims of the secular rulers. This, conflict had always been smouldering; it had broken out here in one form, and there in another; but now Frederick put it in clear general terms upon which men could combine together. Having delivered this blow, be departed upon the pacific crusade of which we have already told. In 1239, Gregory IX was excommunicating him for a second time, and renewing that warfare of public abuse in which the papacy had already suffered severely. The controversy was revived after Gregory IX was dead, when Innocent IV was Pope; and again a devastating letter, which men were bound to remember, was written by Frederick against the church. He denounced the pride and irreligion of the clergy, and ascribed all the corruptions of the time to their pride and wealth. He proposed to his fellow princes a general confiscation of church property-for the good of the church. It was a suggestion that never afterwards left the imagination of the European princes. He never gave up of Sicily! It is possible to piece together something of his court, life in Sicily. He is described towards the end of his life as "red, bald, and short-sighted"; but his features were good and pleasing. He was luxurious in his way of living, and fond of beautiful thing. He is described as licentious. But it is clear that his mind was not satisfied by religious scepticism, and that be was a man of very effectual curiosity and inquiry. He gathered Jewish and Moslem as well as Christian philosophers at his court, and he did much to irrigate the Italian mind with Saracenic influences. Through him Arabic numerals and algebra were introduced to. Christian students, and among other philosophers at his court was Michael Scott, who translated portions of Aristotle and the commentaries thereon of the great Arab philosopher Averroes (of Cordoba). In 1224 Frederick founded the University of Naples, and he enlarged and enriched the great medical school at Salerno University, the most ancient of universities. He also founded a zoological garden. He left a book on hawking, which shows him to have been an acute observer of the habits of birds, and he was one of the first Italians to write Italian verse. Italian poetry was indeed born at his court. He has been called by an able writer, "the first of the moderns," and the phrase expresses aptly the unprejudiced detachment of his intellectual side. His was an all-round originality. During a gold shortage he introduced and made a success of a coinage of stamped leather, bearing his, promise to pay in gold, a sort of leather bank-note issue. In spite of the torrent of abuse and calumny in which Frederick was drenched, he left a profound impression upon the popular imagination. He is still remembered in South Italy almost as vividly as is Napoleon I by the peasants of France; he is the "Gran Federigo." And German scholars declare that, in spite of Frederick's manifest dislike for Germany, it is he, and not Frederick I, Frederick Barbarossa, to whom that German legend originally attached-that legend which represents a great monarch slumbering in a deep cavern, his beard grown round a stone table, against a day of awakening when the world will be restored by him from an extremity of disorder to peace. Afterwards, it seems, the story was transferred to the Crusader Barbarossa, the grandfather of Frederick II. A difficult child was Frederick II for Mother Church, and he was only the precursor of many such difficult children. The princes and educated gentlemen throughout Europe read his letters and discussed them. The more enterprising university students found, marked, and digested the Arabic Aristotle he had made accessible to them in Latin. Salerno cast a baleful light upon Rome. All sorts of men must have been impressed by the futility of the excommunications and interdicts that were levelled at Frederick. The Pope therefore looked for some candidate willing to depose the " heretics " by force of arms ( he offered the Sicilian Crown under Papal suzerainty to Edmund son of Henry III of England ); Henry III of England immediately backed an invasion force with cash ; and with Conrad's IV death in 1254 , shortly after his capturing of Naples , Innocent IV entered the Regno with his young charge Conrad V ( Conradin ) as a figurehead for his plans to annex the South to the Papal State. However Manfred was able to rally the Hohenstaufen forces ; Conradin had defected to him , and in 1258 Manfred had himself crowned King of Sicily. The papal " crusade" aganst the Hohenstaufens continued to embroil the entire peninsula. With the accession of King Louis IX's of France former Chancellor as pope Clement IV (G.Foulquois) ,the original papal candidate for the throne rose again ; Charles of Anjou , Louis' and ruthless younger brother , Count of Provence since 1246. He saw now a means of uniting papal hostility , french resources and his own ambitions to create an Empire in the Mediterranean. He undertook a crusade and he defeated Manfred on February 26 1266 in Benevento ending any hope of a native ruler. In 1268 Conradin aged 15 called from Germany by the Ghibellines forces was also defeated in Tagliacozzo by Charles , destroyed his army , massacring the captives. Conradin brought to Naples was publicly beheaded , an act that shocked all of Europe and Charles founded the Angevin dinasty in Naples. 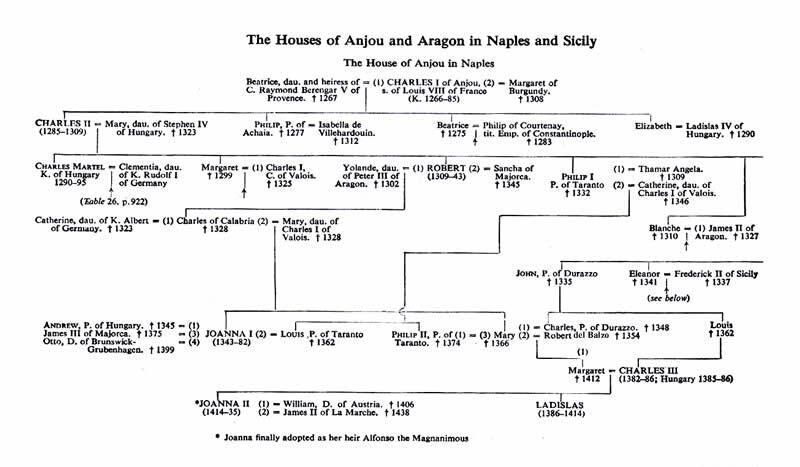 The heir of the House of Hohenstaufen was Constance , daughter of Manfred , whose husband , Pedro III of Aragon , was destined to become , the first Aragonese King of Sicily ( 1282-1285 ). 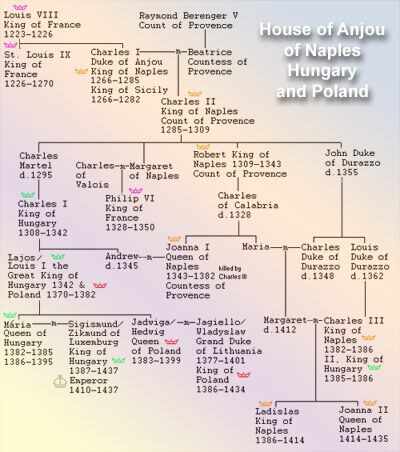 Charles of Anjou , now King Charles I ( 1265-1285 ) to efface the memory of the Hohenstaufen , immediately moved his capital from Palermo to Naples and began calling his realm Kingdom of Naples ( institutionaly his title was Rex Siciliae ). His change was prophetic , on March 30 , 1282 , a conspiracy designed to end the Angevin ambitions spread throughout the Mediterranean , the revolt known as the Sicilian Vespers brought the emperor of Bysantium Michael VIII Paleologus , Pedro III of Aragon together to wrest Sicily from the Angevins , the twenty- years war , followed the capture of Charles II ( 1285-1309 ) and the eventual Aragonese control of Sicily. (Charles of Anjou), 1227-85, king of Naples and Sicily (1266-85), count of Anjou and Provence, youngest brother of King Louis IX of France. He took part in Louis's crusades to Egypt (1248) and Tunisia (1270). After obtaining Provence by marriage (1246), he extended his influence into Piedmont. He became senator of Rome (1263, 1265-78) and undertook to champion the Papal cause against Manfred in the kingdom of Naples and Sicily. In reward, he was crowned king (1266) by Pope Clement IV. Charles defeated (1266) Manfred at Benevento and defeated and executed Conradin in 1268. As leader of the Guelphs, or papal faction, he gained political hegemony in Italy and won suzerainty over several cities in Tuscany, Piedmont, and Lombardy, but his overbearing policies led to a cooling of his relations with the papacy. Planning to establish his own empire, he allied himself with the deposed Byzantine emperor, Baldwin II, against Michael VIII and fought for years in the Balkans. Corfu, Epirus, and Albania were taken, but the crushing taxes necessitated by his wars and his appointment of oppressive French officials to exact them led to the Sicilian Vespers (1282). The ensuing war against the Sicilian rebels and Peter III of Aragón, chosen by the rebels as King of Sicily, continued under Charles's son and successor, Charles II. 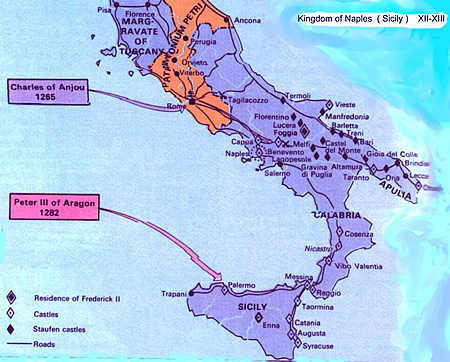 The first Angevin dynasty in Naples was founded. The Angevin period was one of the international influence , prosperity and cultural and religious brilliance for Naples. The Angevin' possessions in Anjou , Provence and Piedmont , created an immediate surge in the city' s population and trade. Merchants from Ctalonia , Marseilles , and Florence founded trade emporiums , Bankers and Investors filled the new section of the City. Castel Nuovo , soon became the new Royal residence , population reached 40,000. Charles II ( 1285 - 1309 ) expanded Castel Sant'Elmo and the Certosa di San Martino. His wife was Mary ,queen of Hungary. Louis VIII of France , who left him the County of Anjou as an apanage . He also became Count of Provence in 1246. Supporting the economic and maritime policy of Marseilles , he became involved in Italian politics . In 1266 as previously said , he was offered the throne of Sicily by Pope Clement IV (1265-68) Guy Foulcaud and with the consent of his brother King Luis IX of France. He fought against Manfred and the Hohenstaufen dynasty, conquered Sicily and tried to establish a hegemonic Mediterranean Kingdom with Palermo as its capital, acquiring also succession rights in the Balkans and the Latin Kingdom of Jerusalem. Under his influence, Louis IX organized the crusade against Tunis, where the King died. Charles policy , instigated an open revolt in Sicily against the Angevins supported by the Aragonese : the revolt broke out in Sicily in 1282 and was so named because it erupted at the hour of Vespers. Dynasty , it was led by counsellors and former ministers of King Manfred , who were faithfully to Constance his daughter wife of Peter III of Aragon , I of Sicily. The merchants from Provence and he merely used Sicily as source of Royal revenue. The Angevins government in the Island fell and Charles effort to crush the uprising failed , despite the support of the Papacy and by his nephew Philip III of France . Peter III was proclaimed King of Sicily , under the conditions that he administers according to his own laws and as separate Realm. Charles lost Sicily and moved the capital to Naples , reigning over the mainland provinces. King of Naples and Count of Provence ( 1285 – 1309 ). Son of Charles I , he continued his father policy ; he introduced the French style of government , combining royal autocracy with feudal organisation of the countryside. He became influential at Rome and was involved in Papal affairs. His effort to conquer Sicily led to a long struggle with Aragon , forcing to accept the loss of Sicily and the peace of Caltabellotta (1302) separated formally the two Kingdoms. (Alfonso the Magnanimous), 1396-1458, king of Aragón and Sicily (1416-58) and of Naples (1443-58), Count of Barcelona. He was the son of Ferdinand I, whom he succeeded in Aragón and Sicily. Queen Joanna II of Naples sought his aid against Louis III, rival king of Naples, and, after Alfonso had defeated (1421) Louis, Joanna adopted Alfonso as her heir. They quarrelled in 1423, and when Joanna died (1435), she left her throne To Rene’ of Anjou. Attempting to conquer Naples, Alfonso was captured (1435) by the Genoese, but he was released through the intervention of the Filippo Maria Visconti Duke of Milan. In 1442 he defeated René, took Naples, and was recognized (1443) as King by the Pope Eugene IV. Alfonso's cohorts within the city opened the passage and let the invaders in. The subsequent sacking and pillaging was atrocious, but Naples was now rejoined to Sicily, unifying the Kingdom of Two Sicily for the first time in two hundred years. Afterwards, Alfonso went back outside so he could enter the city officially on 26 February 1443 in a golden chariot and sheltered by a canopy held by 30 disgruntled Neapolitan noblemen. That entry is memorialized in the Aragonese victory arch over the entrance to the Maschio Angioino, the Angevin Fortress. It was a task they did not like, for a king they did not like, at the beginning of a dynasty they would not like. Shortly thereafter, Alfonso left his Spanish holdings to his brother and dedicated himself full-time to his own Aragonese dynasty in Italy. Leaving his Spanish possessions under the rule of his wife and his brother, Alfonso spent the rest of his life in Naples, where he accorded great privileges to Spanish nobles and tried to introduce Spanish institutions. A patron of arts and letters, he held a splendid court and beautified the city. Alfonso also played a vigorous part in Italian politics. He left Naples to his Son Ferdinand I and the rest of his kingdom to his brother John II. Neapolitans always considered Alfonso a foreigner, particularly because of his habit of surrounding himself with only his own countrymen Catalans and Aragonese , giving them the choice positions at court. Avoid the Spanish, Lower the taxes and keep on good terms with the princes in Italy, specially the Popes. Alfonso was regarded as a cultured person; he founded an excellent library, and artists, poets, philosophers and scholars were an integral part of his court. In the field with his troops, he lived the same life as his men and exposed himself to danger in battle with no regard for his own personal safety. Alfonso also went among the common people incognito to find out how things were going. He liked to listen rather than talk and claimed to be a simple person, once saying he would have been a hermit if he had had his choice in life. Because of his patronage of the arts he became known as Alfonso the Magnanimous. He also started the total rebuilding of the Angevin Fortress, fallen into ruin since its completion in the late 1200s; he paved the streets of the city, cleaned out the swamps and greatly enlarged the wool industry that had been introduced by the Angevins. In spite of his pretensions to simplicity, he was addicted to splendour. At a Neapolitan reception for Frederick III of Germany, the order of the day to all the artisans in the Kingdom was to give Frederick's men whatever they wanted and send Alfonso the bill. Then they all went hunting in the great crater known as the "Astroni" in the Phlegrean Fields and had a banquet at which wine flowed down the slopes and into the fountains for the guests. Parties, however, did not prevent Alfonso, by the time of his death in 1458, from also having developed the Kingdom of the Two Sicily into the foremost naval power in the western Mediterranean. Alfonso's illegitimate son, Ferrante I (1417-1494), succeeded him in 1459 and in spite of extreme hostility on the part of the feudal lords in the kingdom, succeeded in strengthening the monarchy at their expense. He also drove the Angevin fleet from Ischia, their last stronghold in the area. Ferrante countered baronial hostility most violently. The great barons hostility , in the Kingdom of Naples has its remote origin mainly , in the great power that the Aristocracy held since the Angevin conquest , the feudal system that was established by the Lombards and Franks and the reluctance of some of the most powerful Lords to accept the central ruling toward their “ own autonomous states” , was the last struggle between the feudal Lords and the making of a modern State. The Baron Conspiracy was already conceived in 1459 by Marino Marzano Duke of Sessa and Giovanni Antonio Orsini del Balzo Prince of Taranto representing John of Anjou as legitimate King ; Ferrante was defeated in Sarno , but then he recovers in Calabria in 1464 and in the Battle of Ischia in 1466 , where John of Anjou natural son of the King Rene’ of Anjou , retender to the throne ,returned in Provence. In 1485, a renewed conspiracy was supported by the Pope Innocence VIII (1484-1492) Giovanbattista Cybo, who secretly had aspiration for his family of feudal possession in the Southern Realm. The majority of the great Lords took active part: Antonello Petrucci secretary of the King, Antonello Sanseverino Prince of Salerno and Francesco Coppola Count of Sarno, were the most important promoters. The participants were the most relevant feudal families of the Aragonese period : Pirro del Balzo Prince of Altamura , Piero Guevara Marquis del Vasto , Girolamo Sanseverino Prince of Bisignano , Matteo Acquaviva Prince of Teramo , Giovanni Caracciolo Duke of Melfi , Antonio Centelles Marquis of Crotone , Anghilberto del Balzo Duke of Nardo’, Giovanni Paolo del Balzo Count of Nola , the Count of Lauria , the Count of Capaccio , Bernardino Caetani Count of Morcone , Berlinghieri Caldora , Salvatore Zurlo , Simone Caetani , Gian Francesco Orsini , Traiano Pappacoda. The aristocracy was represented in his vast majority from the old to the most recent ones: Sanseverino as feudal Lords and large estates, Petrucci as nobility coming from culture, law and knowledge, Coppola as nobility coming from trade and commerce. On the 11th August 1486 a peace-agreement was signed by Ferrante and all Barons, amnesty was granted, to confirm the agreement Ferrante offered to marry his niece with the son of Francesco Coppola Count of Sarno. On the day of the wedding most of the Barons were arrested and executed. The consequence was a continuous struggle during the all period of his reign. Ferrante main objective, was to show the barons that feudalism was truly dead he made a lot of them dead, by doing things such as inviting them and then arresting, jailing and executing a number of them. Some were fed to the crocodiles which prowled the waters of the moat. (A skeleton of one such reptile hung over the arch in the Castle until quite recently.) He even mummified some of his late enemies and kept them on display in the dungeon of the Castelnuovo (the alternate name for the Maschio Angioino, meaning, simply "New Castle", thus distinguishing it from the older Castel dell'Ovo, the Egg Castle). The French reappeared with designs on the throne of Naples. Under Ferrante's successor, Neapolitan resistance to the French was utterly ineffective and the French, under Charles VIII, took the city virtually unopposed; indeed, they were welcomed by most of the nobility, who sensed a chance to recoup their losses. Their toadying didn't work. The French pillaged the city, anyway, and dispossessed a number of the nobles. Charles, however, suddenly found himself cut off: The Papal State, Milano, and Venice —which had just let Charles pass through unhindered on the way to Naples— suddenly formed an alliance behind and against him. Charles had to fight his way back home, attempting along the way, and failing, to bribe the Pope into crowning him King of Naples. The jibe by historians is that the French brought two things back from their Italian campaign: the Renaissance and syphilis, one of which history has dubbed morbus gallicus in their honour. The Neapolitans always claim that he was “a mal franzoso “, naturally was originated in the Americas. France then tried something else: the proposal of an Alliance to Ferdinand of Spain against Spain's own Aragonese relatives in Naples, by virtue of which the Kingdom of Two Sicily would cease to exist and be divided between Ferdinand and Charles. This would effectively give them both one less rival realm in the area, as well as squelch the heresy that it wasn't nice to carve up one's own cousins. Ferdinand went for it and even Machiavelli, himself, later said that Ferdinand had certainly needed no lessons from anyone in ruthless princemanship. The pact of Granada was signed on 11 November 1500; the Kingdom was to be divided, with the capital, Naples, going to France. The French re-entered Naples in July 1501. It now seemed, however, that both France and Spain had had their fingers crossed at the signing of the original treaty, so they had a war over it and Spain won. In May 1504 Spanish troops evicted the French and entered Naples, ending the Aragonese dynasty, and the Kingdom, intact, became a colony of Spain. Naples was now no longer the capital of its own realm. In a few year's time, with Charles V of Spain crowned Holy Roman Emperor, heir to the Caesars and Charlemagne, it would be part of an empire, as it had been more than a thousand years earlier. True, the East had fallen and what was left of Christian Empire was all in the West; but after 1492, 'West' meant something monumentally different in human history. The Empire had shifted, spreading from Europe to the Americas and on to the Pacific. The age of Empires on which "the sun never sets" had arrived.